Chronic Inflammatory Demyelinating Polyneuropathy (CIDP) Symptoms, Causes, Treatment. CIDP treatment at home, prognosis and prevention. Chronic inflammatory demyelinating polyneuropathy (CIDP) is an acquired disorder of peripheral nerves and nerve roots. It is a chronic monophasic; progressive or relapsing symmetric sensorimotor disorder characterized by progressive muscular weakness with impaired sensation, absent or diminished tendon reflexes and elevated cerebrospinal fluid (CSF) proteins. Chronic inflammatory demyelinating polyneuropathy (CIDP) is a rare neurological disorder in which there is inflammation of nerve roots and peripheral nerves and destruction of the myelin sheath (fatty protective covering) over the nerves. This affects how fast the nerve signals are transmitted and leads to loss of nerve fibers. Onset may occur at any age but is more common in the 5th and 6th decades. Let’s review Chronic Inflammatory Demyelinating Polyneuropathy Symptoms, Causes, Treatment. CIDP typically starts insidiously and evolves slowly, in either a slowly progressive or a relapsing manner, with partial or complete recovery between recurrences; periods of worsening and improvement usually last weeks or months. Most experts consider the necessary duration of symptoms to be greater than 8 weeks for the diagnosis of CIDP to be made. The exact cause of CIDP is unknown but there are strong indications that CIDP is an autoimmune disorder. Autoimmune disorders occur when the body’s natural defenses (antibodies and lymphocytes) against invading organisms suddenly begin to attack perfectly healthy tissue. Chronic inflammatory demyelinating polyneuropathy is believed to be due to immune cells, which normally protect the body from foreign infection, incorrectly attacking the nerves in the body. 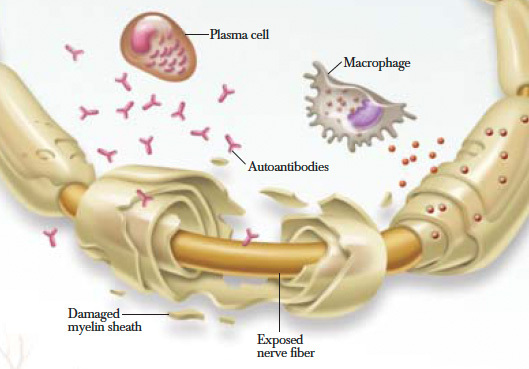 Current theory holds that the body’s immune system, which normally protects, perceives myelin as foreign and attacks it. Myelin is an important part of the peripheral nervous system. It wraps around the nerve axon acting as insulation. When myelin is damaged or removed, these electrical impulses are slowed or lost, and messages transmitted from the brain are disrupted and may never make it to their final destination. Corticosteroids (Prednisone, Prednisolone) are similar to naturally occurring anti-inflammatory hormones made by the body, and can be used as an initial treatment. Corticosteroids often improve strength, are conveniently taken by mouth, and are inexpensive. Side effects however can limit long-term use. High dose Intravenous Immune Globulins (IVIG) is the only drug that has FDA, Canadian, and European approval for treatment of CIDP. IVIG contains naturally occurring antibodies obtained from healthy volunteers. IVIG is given through a vein over the course of several hours. Newer preparations of higher concentrations that can be given under the skin (subcutaneous) are currently being tested in controlled trials in CIDP patients. Plasma Exchange (PE), or Plasmapheresis (PLEX), is a process by which some of the patient’s blood is removed and the blood cells returned without the liquid plasma portion of the patient’s blood. It may work by removing harmful antibodies contained in the plasma. Physiotherapy is also recommended along with medical treatment. Therapeutic exercises are prescribed that includes Range of Motion (ROM) exercises, Isometrics and muscle strengthening for treating muscle weakness and preventing muscle wasting. The course of CIDP varies widely among individuals. Some may have a bout of CIDP followed by spontaneous recovery, while others may have many bouts with partial recovery in between relapses. The disease is a treatable cause of acquired neuropathy and initiation of early treatment to prevent loss of nerve axons is recommended.